Solar stocks, reacting to news about the New Energy tax credits, were already dropping when the news broke that Congress rejected the rescue package. 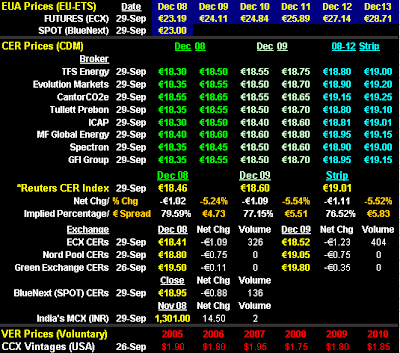 The news did no good for any sector of the market, much less solar stocks. There was a moment some months back when news of toxic waste dumping by solar manufacturers in China set off a short panic in solar stocks. 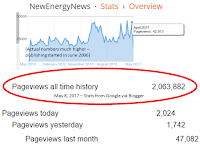 NewEnergyNews suggested taking a deep breath, waiting the day out and buying low at the end of it. Solar stocks came back the next day, as predicted. This is different. Here’s the good news: It’s always darkest before the dawn. There are going to be sessions Thursday and Friday, and maybe even over the weekend again. And there is every reason to think Congress will then pass a bailout package. As for the New Energy tax credits: Staffers on both the Democratic and Republican sides of the House confided to NewEnergyNews that the market was telling the truth: There is no reason to believe lawmakers will put through a bill extending the New Energy tax credits before the November 4 election. Both the House and Senate bills approved extension of the New Energy tax credits and both bodies passed their bills by large majorities. Extension is expected to fail for the 7th time in 18 months, however, because the House and the Senate cannot agree on how to fund extension in a way that will not force President Bush, who claims to want to approve extension, to veto. The Senate passed its version of the extensions 93-2, along with a general package of revenue “pay-fors” on September 23. The House Democratic majority, pushed by the fiscally conservative Blue Dog faction, altered the Senate bill, taking very specific tax breaks away from the oil industry and very specific tax-havens away from the financial sector to create additional pay-fors, passed the new version 226-166, and sent it back for Senate approval September 27. 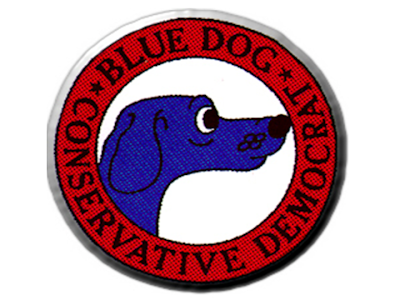 Click to learn more about the Blue Dog Coalition. The House will not approve the Senate scheme for funding the tax credit extensions and the Senate will not approve the House plan. Maybe. Or maybe this is all part of the solution to a different problem, the election. By handling the legislation like this, everybody who wants to can now say they voted for extending the New Energy tax credits. And it gives both parties something substantive to run on. Liberal Democrats will tell their base to actively support their candidates if they want New Energy. Blue Dog Democrats and Republicans will tell their base to actively support their candidates if they want New Energy but not new taxes. It’s also why solar stocks are likely to plummet farther, for longer, this time. Buying low this time is only for those who can afford to hold the stocks for some time, possibly until well into 2009, before seeing any significant upturn in value. Last caveat on solar stocks: Those who can buy solar stocks as they bottom out, and hold them, will eventually be glad they did. Why? Because while the fiscally conservative Blue Dog Democrats in the House are leading the pack now, there is every reason to believe a compromise can be reached after the election. The current stalemate benefits all the players politically. After the election, however, the two parties are likely to hold a “lame duck” session, one last hurrah, according to hill insiders. Speaking off the record, one Congressional staffer told NewEnergyNews Congress is likely to suddenly realize the New Energy tax credits are far too important and far too non-controversial to NOT extend for next year. They have until December 31 to come to their senses and find a way through the partisan mire. And, finally, even if this Congress decides to stonewall New Energy, the next Congress could extend the credits retroactively. Either way, a lot more is now riding on the November 4 outcome. From “the big picture is brighter” file: The fall of solar stocks was particularly pronounced because the major news of the day would otherwise have driven stock values higher. Although there was disappointing news of a toxic spill at a silicon plant in China (no injuries, controlled quickly), Spain announced new feed-in tariff caps of 100 megawatts per quarter plus a bonus hundred megawatts. This constitutes 100 extra megawatts for this year and 100 more megawatts for 2009 than was expected, adding 15% to the total number of megawatts to be subsidized through 2010. It will mean bigger solar energy industry volume. Bigger volume drives costs down. Lower costs means more volume. Etc. Implication: Beyond this contentious silly season, there could be a constellation of factors both in the U.S. and abroad conspiring to drive renewed growth. Solar stocks, reacting to the likely failure of the solar energy industry’s investment tax credit (ITC) to be extended by Congress, were dropping ahead of the news that Congress rejected the financial markets bailout package. H.R. 7060, The Renewable Energy and Job creation Tax Act of 2008 and the 2 more current revisions, H.R. 7201, The Energy Improvement and Extension Act of 2008 and H.R. 7202, Temporary Tax relief Act of 2008, are all expected to be ignored by Congress between now and the election, leaving the vital New Energy tax credits without extension. - One version of the tax credit extensions passed in the Senate September 23. - Another version of the tax credit extensions passed in the House September 27. - Congress expected to adjourn for the election as soon as the financial markets bailout package is settled. - December 31: The existing New Energy tax credits expire. Until extended, the tax credits and the New Energy industries remain in limbo. 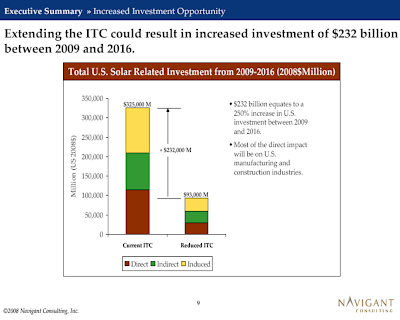 - Research from Navigant Consulting shows the 8-year tax credit extension means 440,000 new solar industry jobs and a doubling of new solar capacity to ~630 megawatts in 2009. (10) removes the controversial tax credit to New York City to help redevelop the World Trade Center zone. (6) closes a loophole on deferred compensation from tax haven corporations ($24.8 billion/10 years). Small wind turbines are big business in the U.S. and getting bigger. 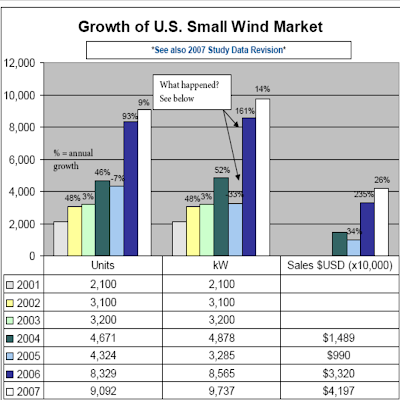 9,092 small turbines were sold in the U.S. in 2007, 14% growth over the previous year, generating $42 million in revnues. 2008 sales figures to date suggest this year’s growth may reach 20%. Ron Stimmel, small wind advocate, American Wind Energy Association (AWEA): "The interest is just skyrocketing. 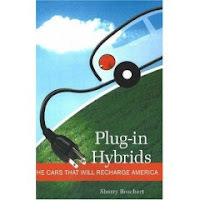 People are looking for ways to seize their own energy future, so to speak, and become personally energy independent while helping to protect the environment…"
Hundreds of models on the U.S. market, 100 kilowatts and less, range in cost from $14,000 to $60,000. A common estimate of average U.S. household power is in the ~1,000 kilowatts/month range. Small turbine power generation is dependent on seasonal and diurnal winds and placement. Example of small wind in action: Dr. Carlos Fernandez, transplant surgeon and turbine seller, uses 4 small turbines on his Paso Fino horse farm north of Washington, D.C. He is not energy independent but his utility purchases have dropped from 5,400 kilowatts/month to 2,000 kilowatts/month. He recently built an indoor training ring that is completely independent of the grid. Dr. Fernandez: "I think sooner or later I am going to be producing more than I use here, because I am always tinkering with more power production…Figuring out how I can get every ounce out of those turbines. Whether it is a taller tower, whether it is better electronics. My goal is to be totally energy independent." 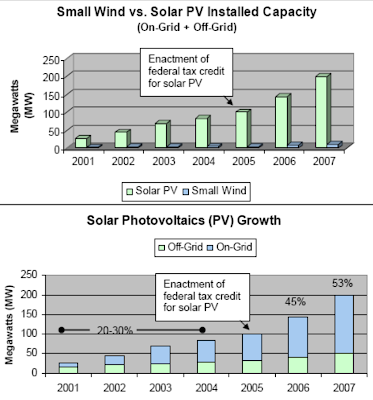 More than a footnote: Based on changes in New Energy sales after 2005, when residential solar photovoltaic systems began qualifying for a 30% investment tax credit (ITC), a provision making small wind eligible for a comparable ITC (included in the currently pending New Energy incentives legislation unlikely to be passed by Congress) would probably add 40-to-50% to annual small wind growth. Small Wind Energy on the Rise in U.S.
With small wind turbine installation booming in the U.S., Dr. Fernandez’s use of small wind turbines to power his horse farm exemplify what is possible. - 2001: 2,100 small wind units installed in the U.S. with a capacity of 2,100 kilowatts. - 2007: 9,092 units installed with a capacity of 9,737 kilowatts. - 8,905 of the 9,092 turbines sold in the U.S. in 2007 were manufactured in the U.S.
- There are at least 49 U.S. small turbine manufacturers and at least 84 non-U.S. small turbine manufacturers. - The market in 2007: 9,092 units sold, 98% (8,905) were from U.S. manufacturers; 14% growth (9.7 megawatts of capacity added); $42 million in 2007 sales; Cumulative U.S. installed capacity is now 55-60 megawatts. - On-grid: 1,292 units, 5,720 kilowatts. 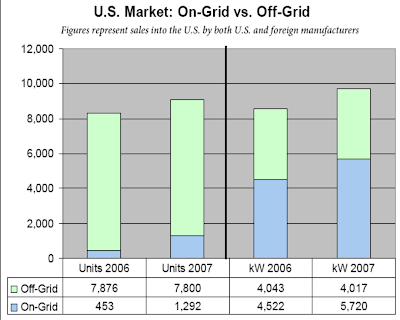 - Off-grid: 7,800 units, 4,017 kilowatts. - There are an estimated 350-to-400 full time jobs and 95 part time jobs from the small wind industry. 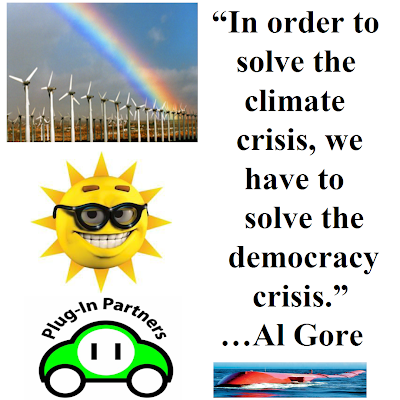 - Costs: $3-to-5 per watt of capacity; 10-to-15 cents per kilowatt of production. - Dr. Fernandez has 20 horses in two barns, 2 houses, an indoor training ring and other structures, all fully powered. - Dr. Fernandez uses 4 small turbines, 2 modern designs made specifically for small scale power production and 2 designed to pump water from deep wells, to drop his utility-purchased electricity from 5,400 kilowatts/month to 2,000 kilowatts/month. His systems include batteries for the storage of excess generation. 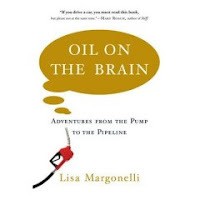 - Dr. Fernandez: "Our own lives have been turned upside down by the cost of gasoline going up in the last two years…I think we would have a lot more freedom if we were to make our own power." - Dr. Fernandez: "This particular one was manufactured in 1905. I found it basically in a yard sale. I brought it home and started playing with it to make a conversion to make electricity…"
- Dr. Fernandez: "For wind power, the main issue is site, you know - where you are going to locate the tower? Obviously trees are not very friendly to windmills unless you can get 20 or 30 feet above them…"
Looking for a market that’s holding its value? Here it is. The Regional Greenhouse Gas Initiative Inc (RGGI, nicknamed “Reggie”) held its first emissions permits auction, the first emissions permits auction in the U.S. The program is regarded as a trial run in anticipation of a national cap-and-trade system to be legislated under the next administration. Many assume Reggie credits will transfer to the national market when it is created. Reggie’s goal is to cut GhGs 10% by 2019. 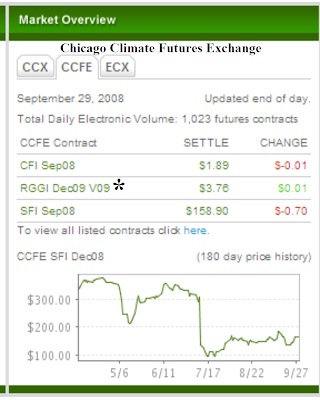 Although the permits, good for the offsetting of 1 ton of carbon dioxide equivalent (CO2e) emissions in the course of generating power or otherwise conducting business, sold at auction for only $3.07, this was 65% above the $1.86 floor price, indicating buyers believe the right to emit will gain value over time. This is considered especially good market performance because Barclays Bank, a veteran of the EU credits market, expected Reggie to be oversupplied and predicted a price of less than $2. Annual allowances available will be ratcheted down yearly to 10% below current levels by the end of 2018. There are 2 goals: (1) To cut GhGs and (2) to drive the development of New Energy. The latter cannot happen, according to experts, until prices for emissions rise, making it more expensive to continue generating them than to invest in New Energy. Kate Hampton, policy head, Climate Change Capital: "[The clearing price] will provide a learning opportunity...You do need a higher price than [$3.75/ton of CO2e] to provide a significant incentive for efficiency…"
Seb Walhain, head of environmental markets, Fortis Bank in Amsterdam, says utilities are unlikely to change their behavior until allowances are at least $10/ton of CO2e. 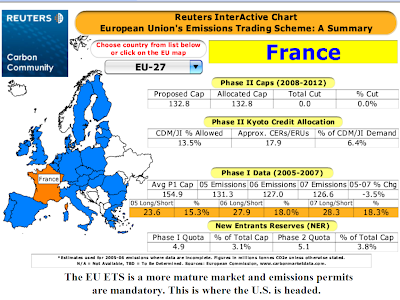 Comparison: European Union (EU) emission allowances on the Emissions Trading Scheme (ETS) were at 23 euros ($33.10)/tonne. The RGGI kicked off its effort to fight global climate change through market-based greenhouse gas (GHG) emissions reductions. The first price for credit to offset one ton of carbon dioxide equivalent (CO2e) was $3.07. - First auction was September 25 in anticipation of a trading regimen that opens January 1, 2009. - The next auction will be Dec. 17. - The first stage of Reggie is scheduled to run 3 years. - Reggie is the first U.S. market for allowances. RGGI incorporates 10 northeastern states: New York, New Jersey, Connecticut, Delaware, Maine, Maryland, Massachusetts, New Hampshire, Rhode Island and Vermont. - The first RGGI auction saw 59 bidders. - The opening price is far lower than the price of permits on the EU ETS but 65% higher than the base rate, suggesting there is demand for them on the expectation their value will increase. - RGGI intends to supply permits for 188 million tons of CO2e/year, 9% over 2007 emissions in the 10-state region. - All 12.57 million permits offered were sold in the auction that received bids for 51.7+ million allowances. - Reggie allows utilities, investors and other buyers to acquire and hold permits. - If increased levels of GhGs are reported, it would be expected to trigger higher demand for permits. - The auction raised $38.6 million for the states to use to cut electricity demand and build New Energy capacity. - Steve Schleimer, energy and environment market regulation director, Barclays Plc. : "People are probably seeing value in buying and holding… If you look at the back end of the program, it does become a short program …"
- Schleimer: "Over time, as load in the region is growing and new plants are coming on line, there's going to be a point where there are 188 million tons made available and emissions will exceed that…That's one reason to see value in it." - Seb Walhain, head of environmental markets, Fortis: "I'm not a big fan of RGGI…"
- Pete Grannis, commissioner, New York State Department of Environmental Conservation: "The first RGGI auction has successfully used market forces to set a price on carbon and this will send a clear market signal to support the investment in clean-energy technologies…"
ENERGY TAX CREDITS – COMPROMISE OR R.I.P. UNTIL AFTER THE ELECTION? Refusal by Congress and the President to extend vital New Energy industries tax credits is looming. One place the story being followed closely is wind-rich West Texas, home to such disparate characters as President Lyndon B. Johnson and President George W. Bush. 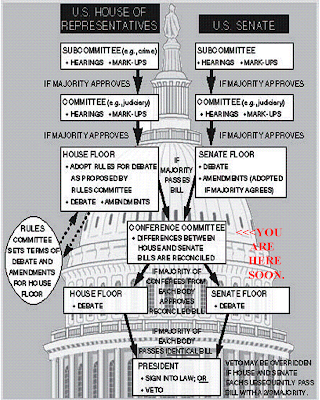 The House-amended version (H.R. 7060) of the Senate-approved bill (H.R. 6049) hit what one House leader called “the wall” in the Senate over the weekend. Though both bills extend the New Energy tax credits, differences about how to fund them make the bills irreconcilable. Though leaders are struggling to draft compromise legislation (H.R. 7201, H.R. 7202), differences do not yet appear near resolution. The cutoff of New Energy’s vital tax credits will hit hard in the President’s West Texas stomping grounds. Some around there are not feeling patient with the political leadership. Greg Wortham, executive director, West Texas Wind Consortium/Mayor, Sweetwater: "Support America or don't…Do their job or get out of office." The local Congressman is more optimistic than most. U.S. 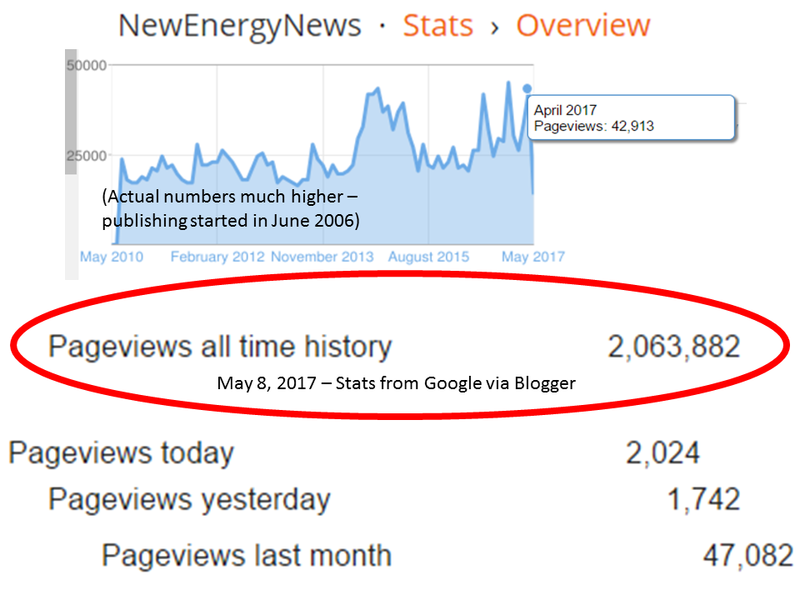 Congressman Mike Conaway (R-Midland): "But I think it will get done this year…"
The fight for New Energy’s vital tax credits, chronicled in detail by NewEnergyNews since the summer of 2007 and especially during the last 2 weeks, is hanging in the balance. The traditional power-generating energy industries have long benefited from subsidies and incentives provided by the taxpayer through acts of Congress (as calculated in a study done at the U.S. Department of Energy’s Energy Information Administration, Federal Financial Interventions and Subsidies in Energy Markets 2007). In recent years, New Energy has begun to get a share of support. There could easily be a debate over whether it deserves more. But to refuse to allow it even what it has been getting is just plain nonsensical. 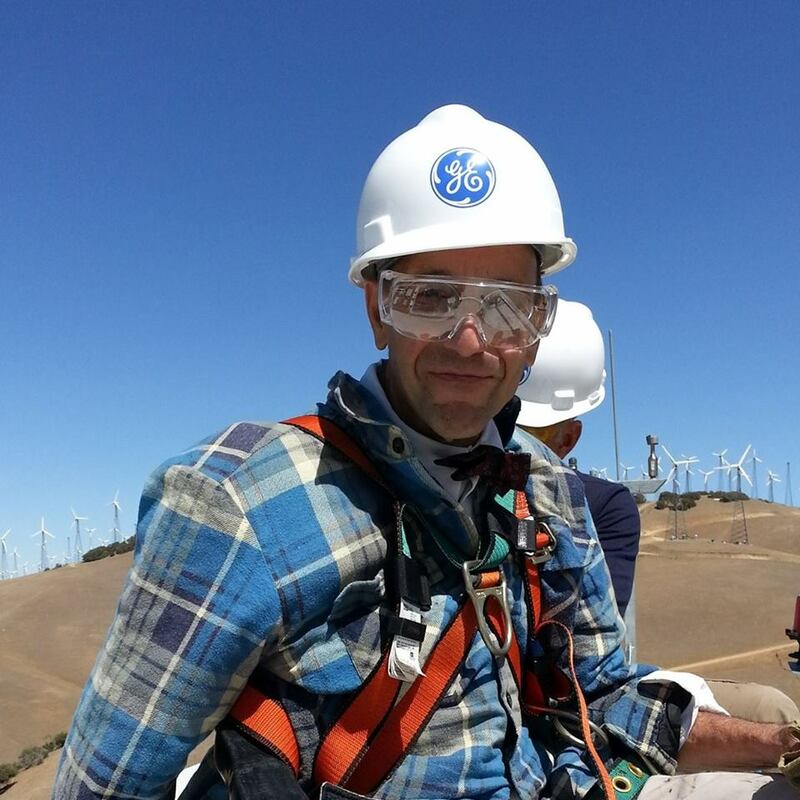 A GE Financial Services study shows investment in New Energy already pays for itself. Numerous other studies show New Energy will, in a carbon-constrained future, be the key to energy independence and world energy dominance. If Congress does not extend the credits, they will expire December 31. With them will go the boom in the New Energy industries, one of the few sectors in U.S. financial markets that has continued to expand through the sadness of the current financial failure. In West Texas, this is not a matter of stock market prices. Mayor Wortham: "There are plenty of projects that are being planned for 2009 that will step back...[People] want to have a good Christmas this year and buy toys for their kids...people that want to have a job in February..."
Ironically, both the House and Senate have approved extension of the New Energy tax credits by large majorities. Extension is expected to fail in Congress, for the 9th time in 18 months, because the House and the Senate cannot agree on how to fund it in a way that will not force President Bush, who claims to want to approve extension, to veto. The Senate passed the extensions 93-2, along with a general package of revenue “pay-fors” on September 23. The House Democratic majority altered the Senate bill, taking very specific tax breaks away from the oil industry and very specific tax-havens away from the financial sector to create additional pay-fors, passed the new version 226-166, and sent it back for Senate approval September 27. Fiscal conservatives in the House and Senate, members who coincidentally represent many in the oil industry and financial sector, call the House pay-fors “raising taxes.” Their opposition cannot stop a bill containing such pay-fors in the House. They have, though, used – and probably again this week will use – the threat of a filibuster in the Senate to block such a bill from being voted on. The irony: Everybody who wants to can now say they voted for extending the new Energy tax credits. Example: Charles Rangel (D-NY0 Chairman, House Ways and Means Committee, on the version of the bill he knows will produce rejection in the Senate: "With this bill, we can tell our kids and our grandkids that we encouraged energy production from wind and solar to make sure that future generations aren't hooked on foreign oil like we have been…"
The cynicism: Handling the legislation like this gives both parties something substantive to run on. Democrats will tell their base to actively support their candidates if they want New Energy. Republicans will tell their base to actively support their candidates if they want New Energy but not new taxes. Have a visit with Van Jones below. No feathers there. It’s the kind of substance they like in West Texas. Play it loud. From LCVheatison via YouTube. H.R. 7060, The Renewable Energy and Job creation Tax Act of 2008 is unlikely to see the President's desk. H.R. 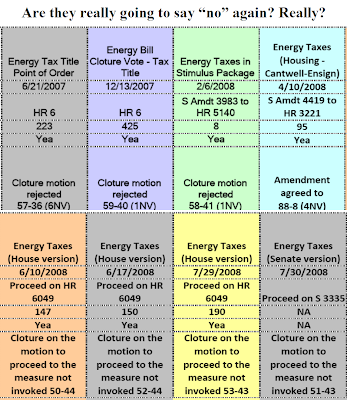 7201, The Energy Improvement and Extension Act of 2008 and H.R. 7202, Temporary Tax relief Act of 2008 are compromise versions. - One version passed in the Senate September 23. - Another version passed in the House September 27. - 7201 or 7202 to be debated, passed by the House? - Taken up again by the Senate? - December 31: Both houses of Congress must approve the measure or the existing tax credits expire on the last day of the year. - Any day now: Congress expected to adjourn for the election. In limbo in the House. - H.R. 7201 and 7202 are reported to have (1) restored tax credits for coal-to-liquid. tar sands and oil shale development, (2) changed the credits to wind energy and plug-in vehicles and (3) reduced the pay-fors from oil tax breaks and financial tax havens. - Rhone Resch, President, Solar Energy Industries Association (SEIA), on what passage means: "You're going to see national markets open up for residential solar…"
- Lyndon Rive, CEO, SolarCity: "Without [the ITC], we're not going to have scale that brings solar to grid parity, and investors aren't going to be interested…"
- Rep. Dave Camp (R-Mich): "It's about what is going to be enacted into law, and the shelf life on this bill is very, very short…"
- Rep. Mac Thornberry (R-Tx): "We've got a bill that has passed the Senate ... that is there for us to vote on and then get to the president…"
”There’s nothing wrong with America that can’t be fixed by what’s right with America.” Bill Clinton. From VanJonesDotNet via YouTube. Kicking off what he promises will be a new PR blitz, energy entrepreneur T. Boone Pickens spoke at the National Press Club in Washington, D.C., on September 22. By now the Pickens Plan is plenty widely known. In spots all over the network and cable airwwaves, in personal appearances on everything but This Old House, and at a website attracting millions to see charts and YouTube videos, Pickens has explained how the U.S. is too dependent on foreign oil and how he believes it can break the dependency by filling the midwestern plains with wind installations to generate electricity and transitioning the natural gas now used in electricity genertion to fuel for a large portion of the U.S. transportation fleet. So why the new campaign? The megabillionaire says his new splash is designed to push the presidential candidates on THEIR energy plans. That Pickens is reaching his audience comes as no surprise to those aware of the reach of the PR firms the oil man hired, Patton Boggs and Benjamin Ginsberg. Energy mavens around the internet and around the world are debating the practicality of building enough wind to meet 20% of U.S. power generation needs (completely doable, as affirmed by a U.S. Department of Energy study published in May) and the practicality of building a transportation infrastructure around compressed natural gas (CNG) (not so much). Skeptics are wondering what is driving T.Boone. Is his motive political? Is he trying to expose a flaw in one of the candidate’s energy plan? Pickens has met with both candidates, contributed to the Republican 2004 cause and went to the 2008 Democratic National Convention to push his energy plan. In fact, for all its potential impracticalities, there is political genius in the Pickens Plan because it brings together the interests of the oil-and-gas industry and the wind industry instead of putting them in opposition. Pickens did say he’s troubled by Republicans convinced they can "drill their way out" of the current energy circumstances. Many say Pickens is in it for personal gain. He is building the biggest wind installation in the world in Texas and owns a lot of natural gas. Pickens answer is that he is 80-years-old, has enough money and wants to do something for his country. "What do I want? I want both of these candidates, and we are going to press it up, you are going to see a new series of ads…I am going to press it up to them that we want a plan, an energy plan to reduce, at least reduce, our foreign oil by 30 percent in 10 years." Finally: Governor Brad Henry of oil-rich Oklahoma endorsed the Pickens Plan as a kick-off to the new campaign. Oklahoma is building wind as fast as it can get turbines. T. Boone explains the "Plan." From pickensplan via YouTube. 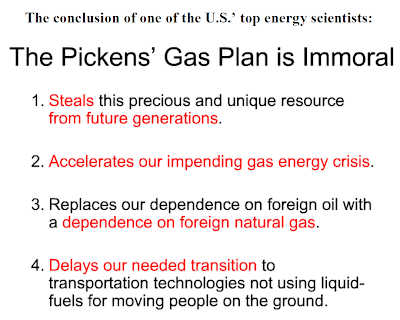 The Pickens Plan condemns the U.S. dependency on foreign oil imports and proposes to change it by building wind installations across the Midwest for power generation and converting a part of the U.S. transportation fleet to compressed natural gas (CNG). - Yearly: $700 billion is transferred from the U.S. to oil-producing nations. 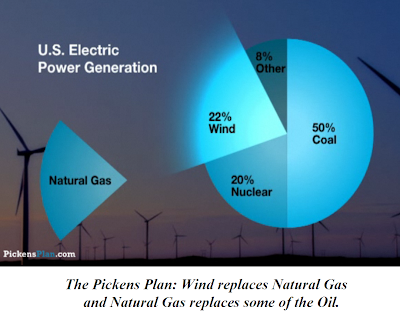 - By 2030: Pickens’ plan would substitute the 20% of U.S. electricity will be generating for the natural gas used to generate that electricity now and use the natural gas to run a significant portion of the U.S. transportation fleet. - Governor Henry’s endorsement should help Pickens win converts in Oklahoma. - The richest source of U.S. onshore wind power is in the Midwestern corridor from the Texas panhandle to the Canadian border. - Pickens, like many others (including both major presidential candidates) believes it is unsustainable for the U.S. to go on spending $700 billion a year for foreign oil. 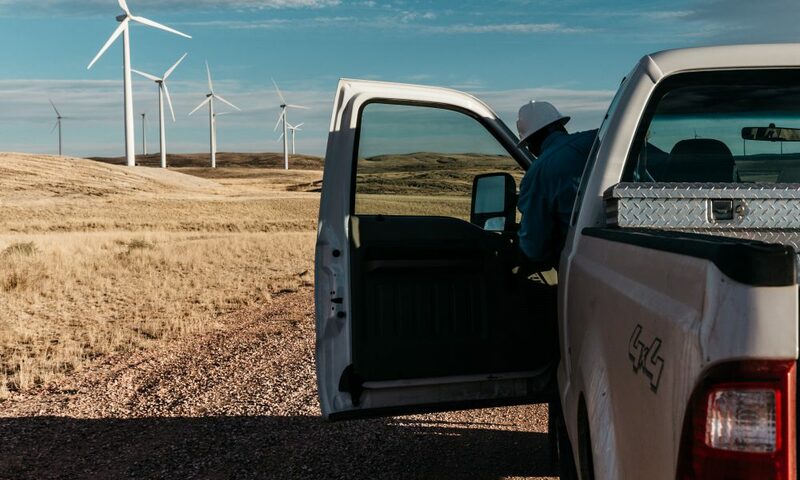 - Pickens believes the $60 billion new national transmission system investment necessary to obtain the fullest production from new wind installations can come from entrepreneurial investment if the government will set a long-term policy supportive to wind development. - Govenor Henry says the Pickens Plan is necessary to protect national security and provide for the U.S. economic future. Between Oklahoma’s natural gas supplies and wind assets, the plan also provides pretty well for Governor Henry’s state’s economic future. - Pickens intends to mobilize an army of 400,000 believers he has signed up at his website in pursuit of a commitment on national energy policy from the two major presidential candidates. He obviously is seeking an endorsement but even if he doesn’t get it, he draws more attention to his plan by elevating himself into the national debate. - Carl Pope of the Sierra Club has been quoted as taking an interest in Pickens’ idea to run the trucking sector, which cannot run on battery power, on compressed natural gas. T. Boone Pickens, petroleum geologist/energy entrepreneur/visionary: "You go 10 years, you are going to be importing 75 percent of your oil…And I promise you the price will be $200 to $300 a barrel, I promise you that. And I keep my promises. I know what I am talking about. And you are going to be spending $2 trillion a year." Wave energy, the final frontier – these are the voyages of a whole host of exciting, ambitious ideas, one or more of which will change the way the U.S. gets electricity. If there is an echo, in that opening sentence, of the William Shatner titles voiceover for the original Star Trek TV show, it is intentional. Wave energy developers are venturing into a virtually undiscovered realm seeking a huge potential energy discovery. In another way, though, every story these days about hydrokinetic energies (wave, tide and current) is very similar: Testing is on-going, trials are imminent, there are a lot of regulatory hassles and there is opposition from environmentalists and the fisheries industries. Case in point: Tillamook County in Oregon, seeing the gold rush going on in nearby Coos County, has jumped into the wave energy industry with goggles, wetsuit and flippers. 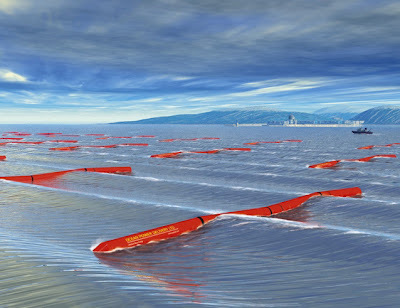 There are a few real wae eenrgy installations in Europe, none in the U.S. Competition along the east and west coasts is presently hottest to lock down parcels of ocean with powerful waves through pilot project applications. Buoy-style and cylinder-shaped concepts are still competing for superiority. The West Coast, with a shorter drop off from the continental shelf into deep waters, holds more wave energy capacity potential than the East Coast, where the continental shelf is broad and offshore waters are shallow (ideal for the development of offshore wind installations). Oregon’s wave energy gold rush began just barely 2 years ago. With small, economically ambitious seaports, coastal transmission networks and accommodating state regulatory policies, Oregon is prime wave energy territory. Ocean Power Technologies (OPT) has been active in Coos County with a buoy device. Tillamook County, with partner with Pelamis Wave Power, is working on a cylindrical technology. A Tillamook County fisherman, describing the Pelamis wave energy device: "It looks like a piece of salami with a 16-foot diameter…"
Regulators in the region are struggling to keep up with the developers. The Federal Energy Regulatory Commission (FERC) oversees projects inside a 3-mile line, and the Department of Interior’s Mineral Management Services (MMS) is responsible for projects outside those waters. It makes the permitting process – interesting? Des McGinnes, business development manager, Pelamis Wave Power: "To use nautical terms, I'd describe the regulatory process as 'confused' and 'changeable…'"
Beyond bureaucratic complexities, confrontation with questions of environmental impact introduces another level of difficulty. There isn’t nearly enough yet known about the impact on marine life and habitat, on fisheries industries or on seabeds and shorelines. The natural result: Opposition from fisheries industries and environmentalists. With at least 2 inevitable levels of hoops to jump through (regulatory and environmental), getting into the wave energy game requires time, money and almost inexhaustible patience. Example: Having sailed through the raging seas of federal and state regulation and completed some successful trial runs, OPT announced earlier this year it wanted to expand a small pilot project into a 200-buoy, 5-mile long project. It got a lot of outrage as a response. Nick Furman, executive director, Oregon Dungeness Crab Commission: "That's five miles of productive habitat we can't put pots in." Example: Tillamook County and Columbia Energy, its development partner, got its permits and financing set up. They are planning trial projects at Garibaldi, in the middle of important chinook fisheries, and at Netarts, in prime crabbing grounds. They are trying to prepare the locals. In response, the locals are trying to prepare the wave energy developers. Linda Buell, Garibaldi Charters co-owner (with husband Mick) and co-chair, fisheries industries advisory committee: "They can't just come in here and grab up fishing grounds without offering anything in return…"
The developers have to get the idea across that local power production means a big local pay day: Jobs, tax revenues, and energy independence through clean New Energy. Locals have to get the idea across to the developers that they’re happy to have the benefits if they don’t come at the expense of ocean habitats, traditional lives and livelihoods and treasured recreational resources. Furman, Oregon Dungeness Crab Commission: "[The Reedsport 10-buoy project is] smack dab in the middle of crabbing grounds…We feel like we're struggling to keep up with the process…Let's put the brakes on a little." The burning industries were always fired by black gold fever. New Energy developers feel the heat of climate change and rising world energy hunger. The folks in the coastal counties wonder why the big city folks are in such a hurry. Tillamook County is joining Coos County in Oregon’s wave energy gold rush. - 2006 to 2008:The Oregon gold rush has developed over the last 2 years. - 2013: Tillamook County large-scale installations are at least 5 years off. 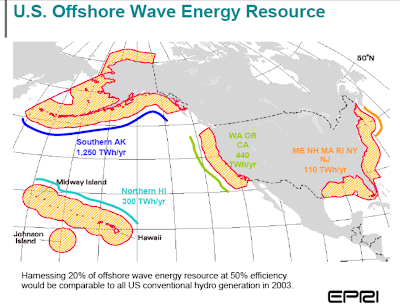 - 2025: Wave energy projects in Oregon could be generating 500 megawatts of electricity. - Oregon’s Tillamook County will develop 6 sites from Newport to Coos Bay. - Neighboring Coos County’s wave energy projects are in a 5-mile stretch, north to south, less than three miles from shore off Coos Bay, prime crabbing territory. - There are a few operating wave energy projects in Europe, none in the U.S.
- Pelamis Wave Power is based in Scotland. - Columbia Energy Partners is based in Vancouver, British Columbia. 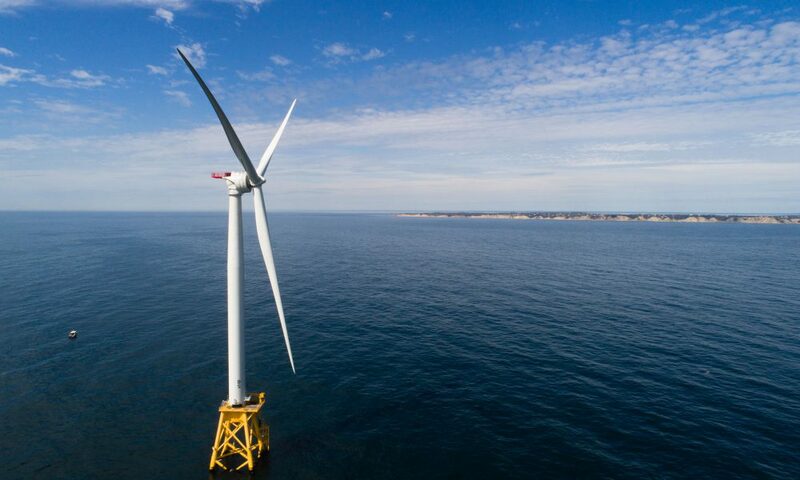 - Ocean Power Technologies is based in New Jersey. - Columbia Energy Partners will do the Tillamook County feasibility study and handle the financing. - Each of the 6 Tillamook County sites is seaward three miles from a utility transmission substation. - The potential 500 megawatts of power capacity Tillamook County could generate is 3% of the state’s present consumption. - The Garibaldi and Netarts projects will each be 30 megawatts, small by the standards of Columbia Energy Partners’ wind installations but a crucial beginning in the wave industry. 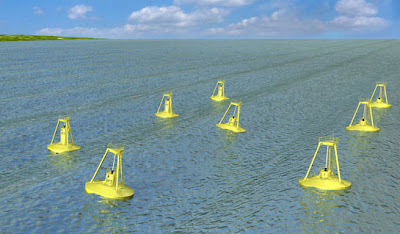 - The big OPT 200-buoy project would have an estimated 200-megawatt capacity. - OPT also has a more advanced 10-buoy project off Reedsport which could begin selling power in the next 1-2 years. - Paul Levesque, chief of staff, Tillamook County: "We can either wait until someone runs roughshod over us, or we can make sure we have a say in what happens…"
- Len Bergstein, spokesman, OPT: "[We want to] show we're relentless in our willingness to sit around the table and discuss this project." Could it be the Kurds have finally had enough of their land being the place where the world comes to fight for oil? 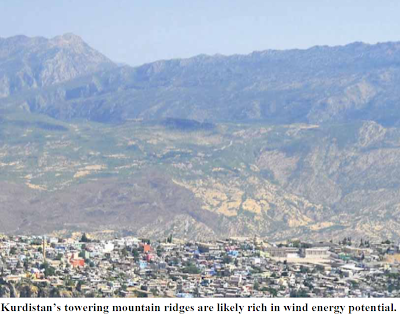 The Kurdistan Regional Government is inviting bids for the opportunity to do a study on the feasibility of building wind energy installations in the 3 Kurdish provinces. The Kurds are sophisticated people, knowledgeable in the ways of the energy world and anxious to go to work build a better tomorrow. For Iraq and the region, it would be a new kind of WMD: Wind as a Major Development. 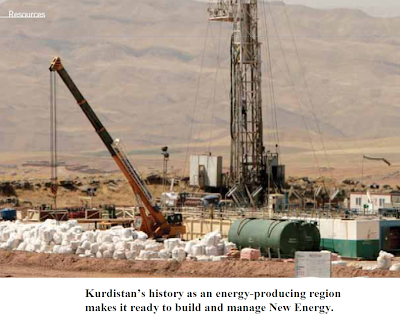 The KRG wants to have a detailed feasibility study done on the potential for development of wind energy in Kurdistan. - English-language bidding documents for an application to do the wind energy feasibility study became available 20 September 2008. - Bids for the opportunity to do the wind energy feasibility study must be delivered no later than 12pm, 20 October 2008. - Bids will be opened at 12:05pm on the deadline date. - Feasibility studies will be for the 3 governorates that make up the Kurdistan region of Iraq. - Bids will be opened at the Ministry of Electricity. - The plan: (1) Identify sites; (2) Collect/analyse wind data; (3) Designate the appropriate parameters for a wind installation at each selected site; (4) Complete a detailed feasibility report for each installation/site. - Bidders for the opportunity to do the feasibility study are required to have experience in wind energy and to have done at least 3 previous detailed wind energy feasibility studies. - English-language bidding documents cost a (non-refundable) payment of payment of 500,000 Iraqi Dinars ($425) in any convertible currency. The documents can be delivered by international courier for an additional $100 fee. - Late bids will be rejected. - Bidders’ representatives are invited to attend the opening of bids at the announced time and place. Designed by architects, LifeVillage(TM) is a self-contained building that can be shipped in 2 containers and rapidly assembled at any location, no matter how remote. It is powered by solar panels and contains a battery system for energy storage. It also has its own water treatment system. LifeVillage(TM) is the product of Envision Solar International, the company founded by architects Robert Noble, AIA, LEED AP, and William Adelson, AIA, to further their goal of making solar energy more available and more aesthetically appealing. Noble: "The LifePort(TM) and LifePod(TM) products were always intended to be enabling technologies for photovoltaics and other clean technology. The LifeVillage(TM), by including energy storage and water treatment, adds utility for an off-grid solution for remote areas without access to traditional infrastructure." Adelson: "We were captivated by what occurred in Africa with the telecommunications industry…With the use of mobile telephones, the system is highly decentralized; effectively, satellite technology evolved more quickly than did the ability to install infrastructure in Africa." 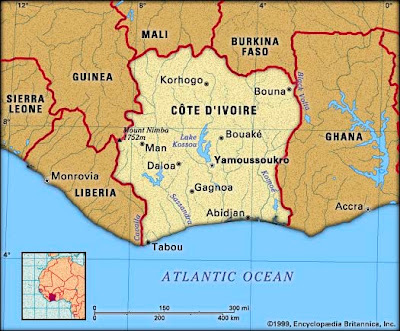 Noble: "The goal is to plant LifeVillages(TM) anywhere decentralized critical infrastructure is needed, starting in Western and Central Africa…"
A demonstration project is planned for Cote d'Ivoire, on the west coast of Africa. An entire village will be built. To demonstrate that LifeVillage(TM) is not only possible but practical, the demonstration project, at the specific request of the Cote d'Ivoire Ministry of Energy, will have both a small medical clinic and a schoolhouse. There will be housing for a resident doctor or nurse and housing for a teacher. Envision Solar is working with Scripps Health and Hospitals of San Diego on the clinic. 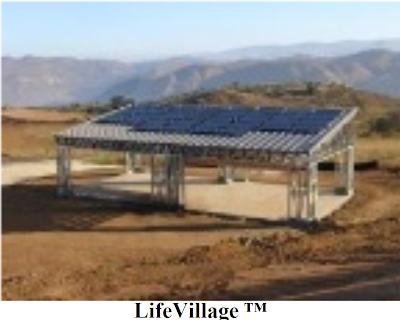 LifeVillage(TM), created by Nobleand Adelson, is "infrastructure in a crate," a modular self-contained, multiple use structure that can be delivered where shelter is needed to provide community buildings powered by solar energy with battery backup and with their own self-contained water treatment system. A LifeVillage(TM) structure can be assembled and activated within two weeks of arrival. - Prototype will be constructed/tested in the U.S. prior to deployment at 100 villages in Cote d'Ivoire. - ZBB Energy is based in Wisconsin. (4) Long-lasting ZESS-50TM zinc battery storage system from ZBB Energy Corp.
(5) A self-contained water treatment unit that will capture and recycle water. 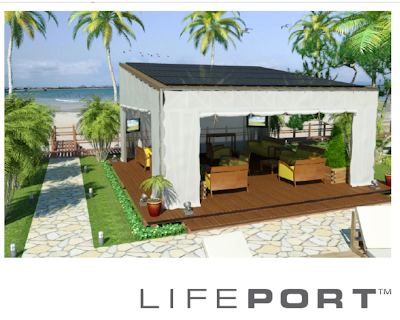 - LifeVillage(TM) can be shipped in 2 shipping containers and assembled on-site. - Nucon Steel will provide the structure framing. - Kyocera will provide the solar panels. - McElroy Roofing will provide the standing seam metal roof. - Worldwater & Solar Technologies will provide the water purification and pumping components. - Noble: "The LifeVillage(TM) structures can be used to create medical clinics, schools, housing for doctors and teachers, cell, mobile telephone, radio, TV, WiFi, and WiMax facilities and transmission. The combination of international building code engineered buildings, solar energy generation and battery storage provides all that is needed to improve health, safety, education, economics and general quality of life around every project or team has planned…"
- Adelson: "We hope that the LifeVillage(TM) product will provide renewable energy and sustainable infrastructure for growth and advancement of underdeveloped areas." WILL ITALY TURN TO NUCLEAR? In the absence of an economy large enough to initiate a massive move to New Energy, governments have 3 choices for large-scale power generation: coal, nuclear or natural gas. In the carbon-constrained society that Europe’s unblinking recognition of global climate change has turned it into, coal is not an option until “clean” coal is proven and becomes financially viable (if that ever happens). Europe’s natural gas supplies must come from Russia or Persian Gulf nations. Europeans do not want to build their energy future around dependency on uncertain supplies from hostile governments. Everybody from Vladimir Putin to John McCain touts the potential of nuclear energy but nobody is actually financing new plants. The problem with nuclear: Cost. 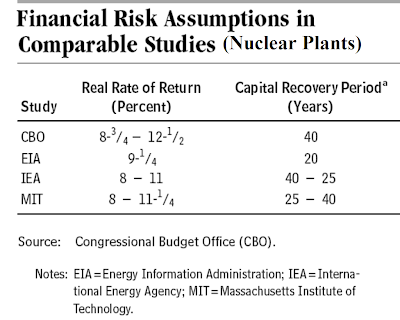 As verified in Rocky Mountain Institute (RMI) studies by Amory Lovins, investment is not presently going into nuclear energy because (1) plants are expensive, (2) extended construction guarantees long payback delays, (3) risks associated with accidents, spills and terrorism require unaffordable levels of insurance and (4) there is still no satisfactory solution for what to do with radioactive waste. Italy’s renewable Prime Minister Silvio Berlusconi recently signaled a change of direction for the country with pontifications about building new nuclear. The preceding, center-left Prodi government, in 2007, instituted a feed-in tariff to drive solar energy development along with wind energy and biomass energy quotas to drive development those areas. As intended, New Energy capacity is rising. Italy has suffered brownouts and power shortages in recent years and takes the question of power supply seriously. It has just brought on line a world class LNG terminal. Will it stand for empty rhetoric about the feasiblity of a financially impractical nuclear future? Or will it push ahead with the development of its sun and wind and recycled waste resources, the real New Energy of tomorrow? Berlusconi’s “national energy plan” calls for new LNG, New Energy and, most of all, new nuclear. - In May, the Italian government said it would begin building nuclear by 2013, the end of the current parliamentary term. - 1987: Italy responded to the nuclear disaster in Chernobyl with a referendum banning nuclear power for 20 years. - Italy has 4 operating nuclear plants and gets 10% of its electricity from them. They were in service before the Chernobyl incident. - Berlusconi claims his plan will lower the cost of electricity in Italy. - Italy expects assistance from the nuclear industries in France and the UK in developing nuclear. - Opposition to nuclear expansion is expected from the political left and from anti-nuclear activists. 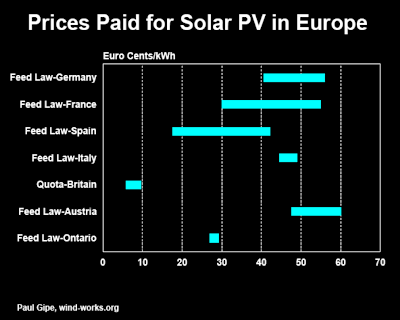 - Italy’s 2007 solar energy feed-in tariff has just this year begun attracting investment from solar producers and installers all over the world. Silvio Berlusconi, Prime Minister, Italy: "From now until next spring, the government will present a national energy plan…[that will include] the launch of nuclear and renewable energy." AKA What goes around comes around (and the theme song). It’s not the Disney version of “The Circle of Life," it’s the Brazilian World Wildlife Fund version, the version Disney would make if its rainforest was being destroyed at the rate Brazil’s is. From dabugattas via YouTube. A "building integrated energy system." It does for wind what solar panels do for solar. The slogan is "Ride the winds of change." It is certainly change you can believe in. In fact, it's change you can buy. From diamondsolar via YouTube. Interesting mix of image and sounds. It starts a little harsh but has a happy ending. Let's hope things turn out as well for the real Earth. Better yet, let's WORK to MAKE it turn out as well. From anitasancha via YouTube. There and Back Again was the name Bilbo Baggins gave to his true account of the adventure most now know by its more famous name, The Hobbit. The fateful adventure of the New Energy tax credit extensions, though without dragons or swordplay, is only slightly less harrowing than Bilbo’s adventure and – like Bilbo going home to The Shire – appears headed once again back to the Senate. Just 3 days ago, the Senate affirmed the tax credits by passing a bill that sent waves of exhilaration through the New Energy world and set New Energy stocks soaring on Wall Street. All the New Energy tax credits in the Senate’s bill needed was ratification by the House of Representatives. No problem. The House originated the legislation last week and passed it then handily. Why wouldn't the House affirm it? The Senate asked only one thing of the House: Pass it the way it was amended in the Senate. The compromises in the reconstructed measure were delicate. Pulling at the slightest thread could cause the whole thing to unravel. But the House has something called the ‘pay-go” rule: For passage, any and all spending must have “pay-fors” from budget revenues. The Senate legislation had lumped the tax credit extensions with a set of large revenue items. That wasn’t good enough accounting for House leaders. They broke the Senate legislation into 4 pieces. One is the Renewable Energy and Job creation Tax Act of 2008 (H.R. 7060). The House bill, which is the rewrite of the Senate bill, which is the rewrite of the House bill (still with this?) appears to now be headed back to the Senate (although a procedural dispute at the end of Thursday left even the final vote uncertain). And nobody yet knows how or where or when the Senate will take it up. “Everything is up in the air, everything is on the table…” a Senate staffer told NewEnergyNews Thursday. The vital New Energy tax credits will expire December 31 if the legislation does not pass. Expiration will likely drive the New Energy industries into recession for 2009. Just as the staffer overestimated the “yes” votes on the Senate measure (it was 93, not 96), he overestimates the chances of anything in this fight going the way it seems likely to go. The fate of the New Energy tax credit extensions is as much in doubt as Bilbo’s fate when he came face to face with the dragon. Since the middle of 2007, this battle for the fate of New Energy in 2009 has been burning like a fire signaling the partisanship now on display in the more prominent financial market bailout fight. It is the same as it has been all along: The House won't pass the extensions without the "pay-fors" and a filibustering minority in the Senate may block any legislation with them. Some speculate Congressional hesitation is due to a fear there will be no revenues to fund the credits in the wake of the financial crisis bail out. New Energy advocates say failure to extend the credits will make the crisis worse while passage will resuscitate the New Energy sector and drive recovery. H.R. 7060 is probably the best (though largely the same) version of the tax credit extensions. 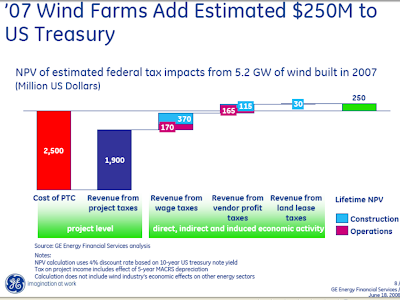 It extends the production tax credit (PTC) for wind a year, the PTC for biomass, hydrokinetic and geothermal energies 2 years, and the investment tax credit for solar and small wind 8 years. 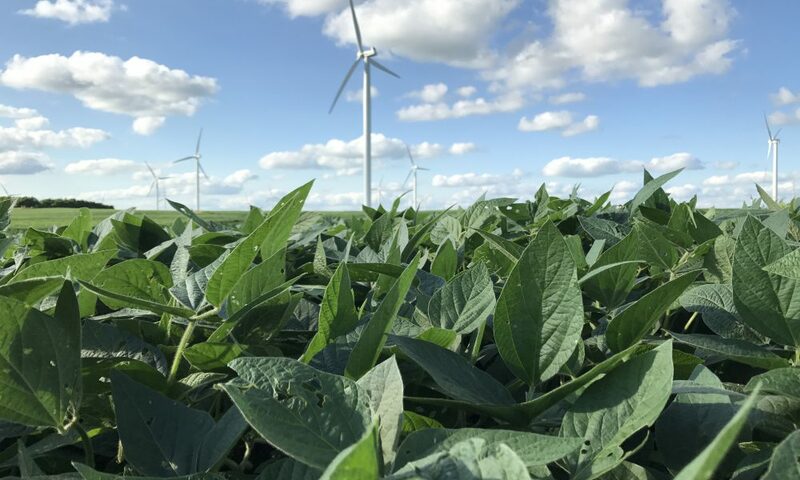 It has an 8-year extension on energy efficiency building improvement tax credits as well as tax benefits for buying electric vehicles (EVs) and for producing cellulosic ethanol and advanced biodiesel. It also extends major R&D tax credits. The bill includes many of the same benefits (to veterans, teachers, Native Americans, hurricane victims, etc.) that were in the Senate package. From an environmental point of view, H.R. 7060 improves the previous Senate bill. It still has tax credits for “clean” coal development. But it no longer provides tax credits to oil shale producers and coal-to-liquid producers. While this will please environmentalists, these removals could add to the difficulty of winning Senate passage. The new House measure also removes a controversial benefit to New York City although why any patriotic citizen would object to a tax credit to help rebuild the World Trade Center zone baffles NewEnergyNews. The pay-fors: H.R. 7060 freezes an oil industry deduction on earnings (raising $4.9 billion over 10 years), changes the way stock sales are accounted for (raising $6.7 billion/10 years), extends existing taxes on unemployment income and the oil spill liability fund ($3.2 billion/10 years), redefines foreign oil earnings and expenses ($2.2 billion/10 years), postpones a cut in taxes on foreign interest earnings ($18.6 billion/10 years) and closes a loophole on deferred compensation from tax haven corporations ($24.8 billion/10 years). The pay-fors are said to have come at the insistence of the conservative “Blue-Dog” Democrats. In combination with fiscally conservative Republicans, they represent enough of a factor to steer legislation. Fiscal conservatism is no doubt a factor but it is also the case that many Blue Dog Democrats, like many Republicans, have big oil industry and financial institution constituencies and the pay-fors come largely from oil industry and financial institution tax breaks. Point of tangential interest: The AMT (not relevant to energy) is not a sticking point. It was discharged earlier. With all the turmoil over the financial market stabilization legislation, it is impossible to know when the House will finish with the New Energy tax credit extension legislation and when the Senate will take it up. If the market stabilization proposal remains embattled, Bilbo Baggins may come into the fray on Friday. If the Princes of partisanship resolve their differences over how to deal with the financial crisis, New Energy could get tacked on to bigger legislation or get put off until after the Jewish holiday. The White House said Tuesday President Bush would sign the tax extenders package passed in the Senate. That was before House pay-fors, to which the President is known to object, were added in. Now a veto is more likely. 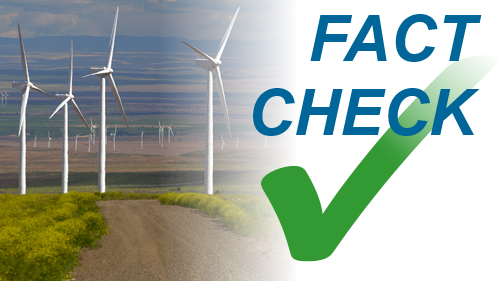 Contact Congress and demand they pass the tax extenders package at: the American Wind Energy Association’s POWER OF WIND or the Solar Energy Industries Association’s TAKE ACTION. - Passed in the House September 25. - Taken up by the Senate ??? - December 31: The House must approve the measure before the existing ITC expires on the last day of the year. - Congress was expected to adjourn for the election September 26 but the financial crisis leaves that in doubt. From the heart of coal country, comes news of a cry for New Energy. A newly released poll shows 52% of West Virginians want the next President and Congress to achieve energy independence by relying on clean energy sources, rather than coal, oil and nuclear power plants. "…their number one  energy-related priority for the nation [is] promoting energy sources such as wind or solar, more conservation of energy, and hybrid or other highly fuel-efficient cars…"
Nationally, 59% hold this position. 71% of West Virginians (73% nationally) want new coal plant construction stopped for 5 years if New Energy development is stepped up. Graham Hueber, Senior Researcher, Opinion Research Corporation (ORC): "What we see in our survey work is that national and state-level attitudes about energy and climate action vary relatively little, even when you drill down into views of the coal state of West Virginia. In fact, in some respects, the residents of West Virginia are even more inclined than other Americans to look beyond coal and other carbon-based fuels to renewable energy sources." 58% of West Virginians (52% nationally) want subsidies/tax breaks/incentives for wind and solar power equal to those for coal-fired and nuclear power plants. 22% of West Virginians (30% nationally) go even farther and want government to "shift all or most [subsidies/tax breaks/incentives] from nuclear power and coal-fired power plants to energy sources such as wind and solar." 45% of West Virginians (40% nationally) have “a small degree of confidence" that political leaders will act. 26% of West Virginians (27% nationally) have "no confidence" they will act. Pam Solo, President/Founder CSI: "West Virginia residents and other Americans deserve credit for understanding that more investment by the state and federal governments in coal and nuclear power is essentially the same thing as investing in subprime mortgages. If U.S. taxpayers are going to directly or indirectly underwrite energy development and energy-intensive industries - such as the auto industry - we need to insist that state officials in Charleston and the next Congress and President make good, solid investments that make sense for the long-term of our country. The only energy investments that rise above the 'subprime' level today are wind, solar and other clean renewable energy in concert with enhanced energy efficiency." 87% of West Virginians (91% nationally) believe reliance on fossil fuels is the product of the 19th-and-early-20th-century industrial revolution and it is time to phase them out in favor of New Energy. 84% of West Virginians (78% nationally) think it is necessary to “take timely and decisive steps” to deal with global climate change by building New Energy, believe it will require “tough choices” but agree we “…cannot afford to postpone decisions since there are no perfect options." Grant Smith, national project coordinator, CLEAN: "Investments in coal and nuclear power are the Countrywide Financial subprime mortgages of the energy world. What the public is saying in this survey is that we support government making investments in the energy sources of tomorrow, but we have to stop flushing money down the drain by propping up the failing energy sources of yesterday…After the current financial debacle on Wall Street, it is hard to imagine that Americans are going to allow more dumb investments by Charleston and Washington on the wrong energy sources." One last point, a warning to political leaders: 93% of West Virginians (91% nationally) consider candidates’ views on energy important in their voting decisions. 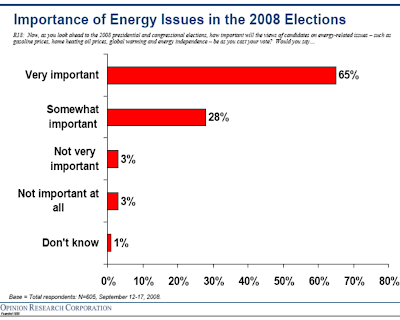 65% of West Virginians (58% nationally) consider the candidates’ views on energy "very important." ORC’s Clean Energy Attitudes of Americans and Clean Energy and West Virginia reveal that public opinion nationally and in coal country favors moving away from coal and nuclear and toward the building of New Energy. The surveys were taken September 12 through 17. The surveys were made nationally and in West Virginia, the heart of coal country. - W.V. Governor Manchin favors the mountaintop removal mining of Coal River Mountain. 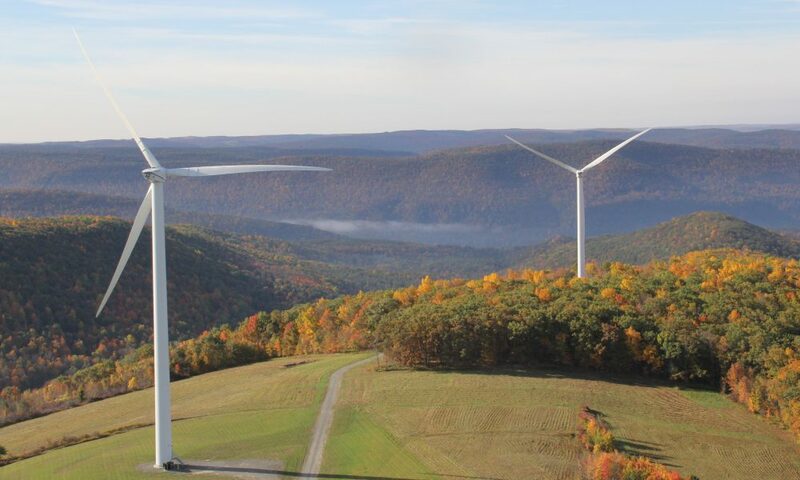 - More than three out of five West Virginia residents prefer that tax breaks/incentives either (1) be divided "between renewable energy, such as wind and solar, and coal-to-liquid plants" (49%) or (2) go entirely to "support (for) renewable energy such as wind and solar" (27%). Only 23% want tax breaks/incentives solely for coal-to-liquid plants. - W.V. Governor Manchin is directing ~$200 million in state tax breaks/incentives to developers of a coal-to-liquids plant. - Only 38% of West Virginians (26% nationally) favor promoting more coal-fired power plants, oil from offshore drilling and nuclear power. 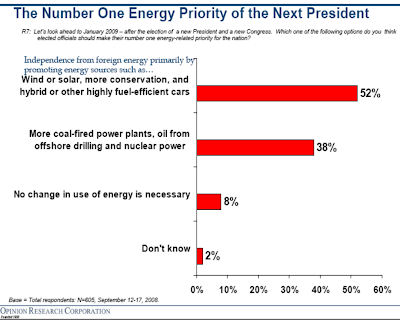 Only 8% (10% nationally) think the U.S. needs no change from its present dependence on foreign energy sources. - Only 16% of West Virginians (10% nationally) would leave subsidies/tax breaks/incentives for nuclear power and coal-fired power the same. - 62% of West Virginians(63% nationally): "global warming is a problem and we have limited time to figure out the solutions to it." - 18% of West Virginians (18% nationally) see “a positive or neutral economic impact” from making changes to deal with global climate change. 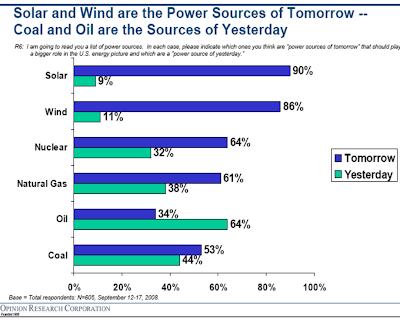 - 56% of West Virginians (67% nationally) pick New Energy over coal or nuclear. 4% of West Virginians (8% nationally) want nuclear and 18% of West Virginians (3% nationally) want coal. - Janet Keating, executive director, OHVEC: "It's great to know that the majority of West Virginians are in step with the rest of the nation when it comes to energy and climate issues. Now is the time for our state-level and national political leaders to begin the transition to a new energy future…"
- Grant Smith, national project coordinator, CLEAN: "It makes no sense to be making 50-year investments in new coal-fired power plants. 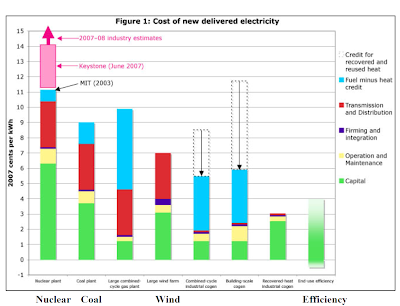 Energy efficiency and renewable technologies already have overtaken, in many instances, or will soon overtake, in other instances, coal-fired power in terms of direct cost and are far superior in terms of financial risk, economic benefit, and the ability to address global warming. There is no viable model under which new nuclear power plants can be constructed as anything other than multi-billion-dollar public works boondoggles…"